Roberts Stream 93i review | What Hi-Fi? We’re impressed with the Roberts Stream 93i from the moment we open the box. This unit is beautifully put together – it certainly seems like a well-engineered product, with substantial weight to back up its desk/counter-top size. It’s not the prettiest black box we’ve ever clapped eyes on, perhaps, but its face, with its large, clear screen and nicely weighted, tactile buttons, is certainly ready for business. The Stream 93i is, basically, an FM/DAB/internet radio that will also act as a music player, accessing your digital music over a local area network (LAN). You can do this via the wired ethernet socket, or the built-in wi-fi. A USB port allows you to play music direct from a memory stick if you don’t have LAN capabilities. The usual more old-school sockets are around the back as well, in the form of a headphone socket and an auxiliary input. There’s also another USB socket, but that’s for service use only. And, in a final flourish, the 93i also has Spotify Connect built in, so you can use your smartphone or tablet (via wi-fi) to remotely control your Spotify music and playlists. The remote control handset is a pleasant surprise, too. From a distance it might look like one of those flimsy, credit-card style jobs, but it’s actually fairly substantial in the hand, and useful. That’s a pretty comprehensive list of features for your £150, and certainly decent value for money, on paper, when compared with any obvious competitors. Our 2013 Product of the Year, the Pure Evoke F4, for example, retails for around £20 more and has similar, though not identical, features. Things really couldn’t have been any easier during set up. We’ve looked at quite a number of similar products in the past, so setting one up isn’t as daunting a prospect for us as it might be for some, of course – but still, we can’t imagine many people struggling. On plugging the 93i into the mains and pushing the power button, a set-up wizard gets to work and pretty much holds your hand through the whole process of accessing your network, scanning the airwaves for FM and DAB signals, and generally getting you up and running with little fuss – just the odd twirl of a knob and a selective push. If you do run into difficulties, the comprehensive instruction manual will get you back on track quickly. Things have gone so well so far for the Roberts Stream 93i that a stumble seems almost inevitable. But as soon as we start listening to the DAB radio, our worries quickly fade away. This radio sounds really good. 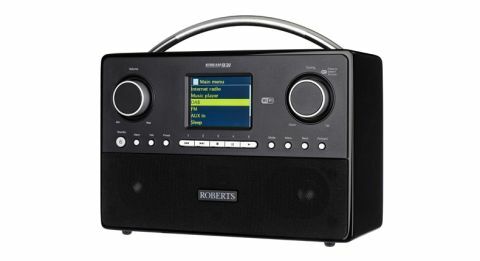 Roberts has managed to combine a clear midrange (important for every type of listening, but absolutely imperative for voice-driven radio) with a bright – but definitely not sharp – treble, and a surprisingly powerful bass. It’s the bass that impresses most, especially when comparing the 93i with price rivals. It’s not at all flabby, but it goes impressively deep for such a relatively small box – the ‘subwoofer’ at the back of the unit is clearly not just for show. Normally, when a smallish unit has noticeably good bass, the other parts of the frequency range can suffer, to the detriment of the overall experience. With the Roberts, however, everything blends together to make a really enjoyable listen – and that’s both with music and voice radio. We start with internet radio – and if you haven’t yet had a dabble with this, we urge you to take the plunge. Many a happy hour can be spent just roaming the dial and picking up stations from all over the world. It’s worth the price of admission alone. With the myriad stations available, it’s probably best to take advantage of the Roberts’ presets. There are 40 available, so you’ll be able to access your most listened to stations quite quickly. Five are directly available via the buttons on the face; those five and the other 35 are also available via a menu accessed by the select control on the right – it’s a twist and push system that we find intuitive to use. Those five preset buttons work for both FM and DAB as well, so you have five go-to stations for each. Radio reception, we found exemplary throughout, although we tend to stick with the internet for its various options – podcasts, catch-up and so on. The music player uses UPnP (aka DLNA), and it found our Naim UnitiServe streamer almost before we’d started looking for it. It won’t play high-res files, but can handle MP3, WMA, AAC, FLAC and WAV. The sound matches the impressive standards we find with radio. Spotify Connect is a winner too. With your mobile device on the same network as the 93i, your Spotify playlists are accessible via the radio and can be controlled using the aforementioned mobile device. It’s very impressive and extremely easy to use. The sound quality isn’t quite up with the radio performance or streaming from the server, but that’s more the nature of Spotify Connect than anything else. It’s great for general background listening. This Roberts is a really fine machine. It covers all bases for radio and adds two impressive features in the form of the music player and Spotify Connect. Most important of all, though, it sounds excellent for a unit of this size and price, with a fast, well-rounded bass performance managing to enhance the rest of the frequency range, rather than overpower it.